Mock tender steak is known by many different names. According to the Texas Beef Council, grocery stores can label it as chuck eye steak, chuck filet steak, chuck tender steak or fish steak. The steak is cut from the mock tender roast, which comes from the chuck part of the cow. 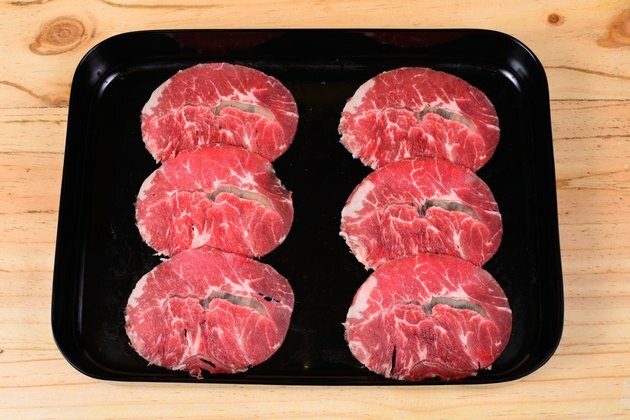 It is a naturally tougher meat and is best cooked through moist methods that tenderize the meat without drying it out. Braising is an ideal method for preparing this food. Preheat a frying pan to high heat. Place a small amount of cooking oil in the pan and allow it to heat up. Place the mock tender steak in the pan and sear it on both sides for about 30 seconds each. Pour about 1/2 cup of braising fluid -- you can use water, broth, wine or beer -- into the pan. Reduce the heat to a simmer and place a lid over the frying pan. Ensure that the lid fits tightly to keep the fluid from evaporating while the meat cooks. Let the meat simmer in the braising juices for 90 minutes to 2-1/2 hours for every 2 inches of thickness. Avoid removing the lid from the pan because that releases heat and moisture. Remove the meat from the frying pan and serve. If you are concerned about whether your meat is fully cooked, take the internal temperature of the meat with a meat thermometer. Cook the steaks to an internal temperature of 160 degrees Fahrenheit.